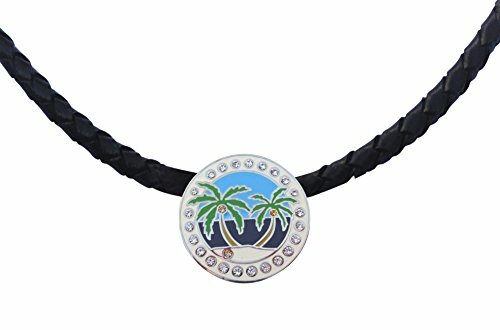 This Golf Fashion Necklace with Island Paradise Golf Ball Marker features an elegant magnetic attachment in the back for easy on and easy off plus the strongest heart magnetic clip on the market to firmly hold your marker place so it will not fall off. The Marker has a beach themed design with swarovski crystals that really pop in sunlight. Check out all the pics. This is an awesome price for this high quality item. The necklace measures 17" around. If you have any questions about this product by FunMarkers, contact us by completing and submitting the form below. If you are looking for a specif part number, please include it with your message.